Home Opinions Moving towards cashless economy – What if cash had an expiry date? While the debates around demonetisation have appeared to have died down, the government appears to pursue one of the objectives of the demonetisation – move towards cashless or less-cash economy. Yesterday, the government proposed to ban all cash transactions/deals worth more than 2 lakh rupees, which is a lakh less than what was proposed in the union budget earlier. The penalty proposed for people who violate this ban has been proposed to be equal to the amount of transaction. The aim is to make people use less cash. In an earlier article, we had explored barriers to cashless-ness and motivations behind cash transactions. But cash or money is not the end in itself, it is merely a tool. Money is earned because it can fulfil your desires. More or less, money is spent in the above 3 ways. This is applicable to white money as well as black money. So is there any difference between the two if both can be spent identically? For #1 and #2 there is no real difference. But #1 and #2 have limitations. How many fruits and veggies will you buy? How many television sets will you buy? One is forced to go for #3. But here is where the real difference comes in. White money can be easily saved in bank accounts, invested and retrieved at the appropriate time for bulk spending. But black money has to be stored in the form of cash and accumulated to be used when necessary. Now for the purpose of illustration let me introduce some magic. Let’s say RBI comes up with a magical note which self-destructs itself one month after it is withdrawn from the bank or ATM. It has to return back to the bank before destruction. Now let us see what happens to above transactions. Type #3 transactions are no longer possible for the cash hoarder. He cannot wait for more than 1 month to spend his cash. In other words, he has to resort only to #1 and #2 which have limitations and that too within one month. As cash itself becomes less attractive, people will be more willing to embrace non-cash modes of transaction. There will be reluctance from lower rungs of the money chain to accept cash thus putting more pressure on undisclosed income. That which was earlier a barrier has suddenly become a catalyst for cashless India. But what exactly was done when we introduced some magic? At a basic level, there are 2 patterns of spending – spend as you earn or save and spend; here we have plugged the savings route. It is important to note that savings are an integral part of the Indian way of life. India has one of the highest savings rate in the whole world (32% of GDP). If the ability to save is disrupted, our cash flow will be altered at a fundamental level. 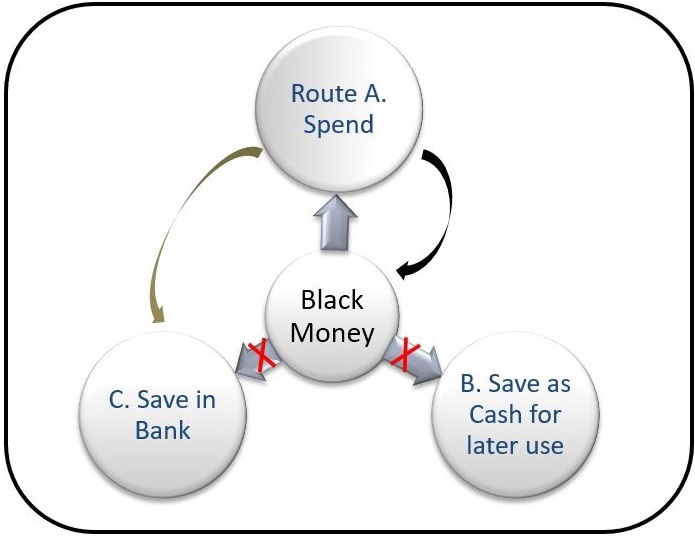 Route C is not an option for Black money hoarders as it can be tracked. It can be further discouraged by taxing deposits thus making it un-economical as opposed to digital payments. The only remaining route is A. But this is not a 100% exit route. Unless one is able to break down cash via this route before it expires, it is lost. High value cash transactions are already banned, thus plugging some leakages on this route. Since there is no outlet, the cash pipe is bound to get choked. There will be tremendous pressure within Route A which in turn will result in more people transacting digitally. But neither a solution nor a problem is permanent. For every problem, there is a solution and every solution will subsequently give rise to other problems. Such a move will come with the cost of cash replacement. There will have to be processes in place to absorb and replace expired cash (within and outside India). Plus we will have the status quoists giving their usual dose of doomsday predictions. But if this reduces overall cash in the economy, the short term losses might be worth it. Had you asked anyone on 7th Nov as to what they think about withdrawing 500 and 100 rupee notes they would have termed it as irrational and scoffed at you. Today no one will say so. An idea sounds outrageous and fictional only because we have not experienced it first-hand. Don’t we deal with coupon codes which expire, have we not used sodexo? Government of India has taken a bold step by demonetisation but without taking this war to its logical end, the problem of black money will creep in again – sooner than later. It is important to reduce the buying power of a note one way or the other, one of the effective ways will be by attacking cash savings. It is time we think long term and take concrete steps to move towards a cleaner economy even if it seems radical to start with.